The timeless art of Carrara Marble wall tiles combines old world and contemporary design styles. The Jeffrey Court 4 in. x 12 in. wall tile offers unlimited design possibilities for any space for an extraordinary design solution. Combine marble wall tiles with mesh-mounted mosaics to create a coordinated look. 1 square foot per pack, 3 pieces per pack. Pack weight equals 5.4 lbs. Buy online Jeffrey Court Carrara 4 in. x 12 in. 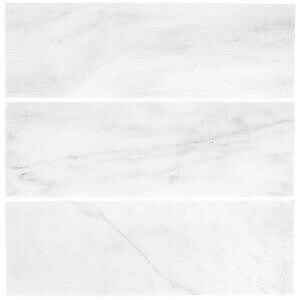 Honed Marble Wall Tile (3-Pack) 99786, leave review and share Your friends.